Christmas this year will be a HOT one. Venturing deep into the unknown world of the Amazon rainforest I’m off to establish contact with an Amazonian indigenous tribe that live in the wilderness close to the Brazil – Peru border. As the first person to form human contact with these undiscovered peoples, while donning nothing more than a fake white beard and a red onesie, I’ll deliver Scott Dunn rash vests and spread Christmas cheer amongst them. In bringing such joy and kindness, I hope, that forever and always I’ll be known to them, quite simply, as Santa. Despite my exotic complexion, skill with a frisbee and beach bod that would look at home on Venice beach, at Christmas time I am actually much more at home with Team COLD. For me, Christmas time is about being with family, eating overly-indulgent meals, drinking warm cider and arguing about who has won Scrabble. Team HOT?! Really?! I hear you cry! But it’s the sunshine that gives me a high. Sorry but I’d much rather that than a festive ski. Since you know those skies won’t be turning grey. As I lie by the pool going browner and browner! It’s a delish BBQ on the Caribbean coast! Everyone loathes and bemoans the typical British winter. The rest of Europe fares better with crisp, beautiful snow falling in place of our incessant rain. Venture to Lapland and Scandinavia, where the white stuff sprinkles its magic flakes, rendering cities prettier, the countryside breath-taking and opening up the possibility of a slew of exciting snow based fun – horse drawn sleigh rides, adrenaline-pumping snow-mobiling, leisurely snowshoeing or gambolling with furry huskies! Go COLD, go North!! 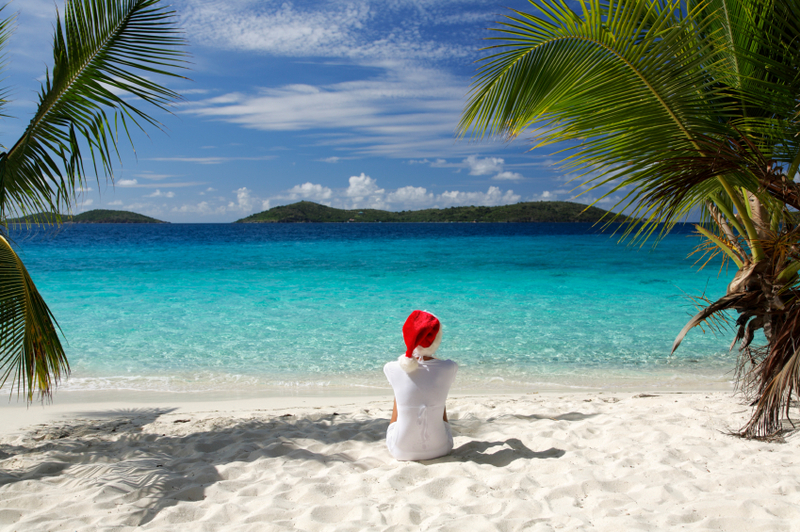 HOT, HOT HOT Christmases rule…. bring on the palm tree lined white sand beaches, a banana daiquiri, the endless acacia dotted plains of the Serengeti or sundowners overlooking Camps Bay in Cape Town. The combination of my Scottish blood, and being born on the 28th of December basically into a snow drift means that cold, snowy weather runs in my veins and I am team COLD! Although don’t get me wrong, I’m all for people booking festive Scott Dunn vacations in the Middle East, North Africa, and the Indian Subcontinent! I am team HOT and my ideal place to spend the festive period would be on Rottnest Island off the coast of Perth, Western Australia. With Perth being the most isolated city in the world there is no better place to get away from it all. With no cars allowed on the island and miles of unspoiled beaches it is pretty much perfect. My Christmas is COLD – but filled with warmth. Frost clutches to the remnants of fallen leaves and chilly noses are buried into tightly wrapped scarves. But there are burning fires, logs crackling, inviting us to rest our feet and warm our toes. Warm hands intertwine, leading one another around a Christmas market, colored lights dancing in the trees. Next stop and a hot wine warms from the outside in. Maybe another for the road! Heart-warming whoops from the nearby ice rink. The temperature falls, and a lone snowflake tumbles from the sky. Warm glowing cheeks turn upwards expectantly, wondering if this is the year for a white Christmas. But in the snow or in the sun? For I love the sea and snowballs too. Or sipping martinis and whiling the hours? The choice is hard…I want the lot! But I guess I will have to be Team HOT. Hey! It’s Christmas! It means a complete covering of snow and lights. No Christmas experience can be more worthwhile than the white, COLD and ethereal city of Reykjavik and the vivid and luminous Northern Lights, while swimming over two different continents in the magical, hot Blue Lagoon. Seeing as some of our Christmas celebratory customs originated from pagan themes and traditions, it seems only right to celebrate Christmas in the sun, and to worship the sun! Head to the Yucatan Peninsula in Mexico and visit the Maya archaeological sites such as Chichen Itza and Uxmal. December is an excellent time to visit – it’s the start of the season and the weather is HOT. Chestnuts roasting on an open fire, Jack Frost nipping at your nose…This is the only way to spend Christmas. A luxurious Scott Dunn chalet in a snow covered resort, a friendly chef happily roasting a turkey in the kitchen, while you put your feet up and relax. Children happily building a snowman outside – there’s a jolly Scott Dunn nanny laughing along with them – while you start on another glass of sherry….Go to the Southern hemisphere and what do you get? Santa in Bermuda shorts and fake snow, no thanks! Team COLD!